An Easy Way to Embed Excel in a Web Page is to use the Edraw office viewer component directly. Many people need to display Excel content on web page or allow an Excel report to be viewed embedded on a Web page. And at present the options for doing so are very limited. The following codes describe an approach to displaying Excel documents within a web page using officeviewer.cab file. 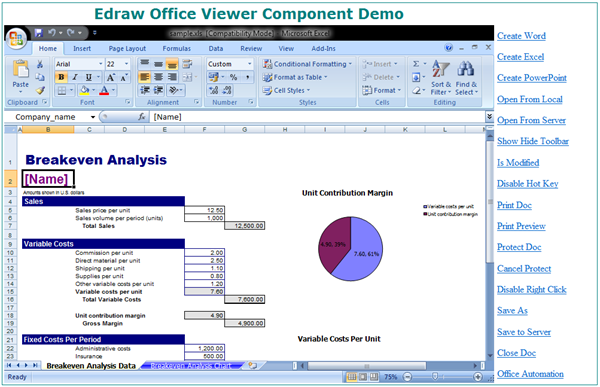 This is how you use the office viewer component to host ms Excel document. And this is how you display an excel document on the fly. The Excel component has some events to help developers load an excel file when the web page loads or set the component properties. The following script is to hide the toolbar and grid when the component was initialized. The Excel Component allows the developer to do the Excel automation. It's possible to use the above code in ASP, ASP.NET or PHP language, too. The component supports seamless integration with Excel 97, Excel 2000, Excel 2003, Excel 2007 and Excel 2010.